From family cars to larger people carriers, Allied Mobility offers a wide range of wheelchair accessible vehicles for sale and for hire. Vista™, which offers bags of space, is based on the Volkswagen Caddy Maxi, a popular choice for those seeking extra room. Vista™ features original Volkswagen seating, plus ample capacity for a wheelchair user or scooter. In fact, it was this very feature that convinced James Pye to choose the Volkswagen Caddy Vista™ as the perfect WAV for him. A long-time Allied Mobility customer James, from Smallthorne, Stoke-on-Trent, took the time to write to us to express his thanks and gratitude for the service he received when choosing his latest wheelchair accessible vehicle. “I had trouble manoeuvring in my existing car”, explained James. Motability is a not-for-profit organisation that provides mobility solutions for people with disabilities. Allied works closely with Motability to help find our customers the perfect wheelchair accessible vehicle for their needs. Our specialists based all over the UK, offer a free home demonstration, so that customers can try vehicles for themselves and find their perfect match. James now uses the car almost every day to get about locally. He’s looking forward to getting out and about with his family too and can hardly wait for the better weather to arrive, so he can visit some of his favourite places along the coast. James placed his order in December last year and took delivery of his new Volkswagen Vista™ in January. 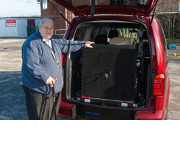 VistaTM, like all of Allied Mobility’s wheelchair accessible vehicles, is available to buy new, buy used or hire. For more information call the number at the top of the page or email send an enquiry by clicking here.